2:56 put AUX screen back on my LuckyUp price pattern-do we have enough juice to make it work? 2:40 When you see a long congestion, you can often find the end by circling it. I show this now on the AUX page. 1:20 Looks like a low - now, will we get any juice? 12:49 took a breakfast break. Did not miss anything. 11:34 Off to a slow start , but the trend is up. I expect greater volatility in the afternoon. taken my four main courses. See http://Moneytide.com -> Courses for more details. bounced off the trendline. Looks like the day is up. 10:29 stopped out 83 - off to a choppy start. 10:19 that overlay is one of many going into the coming Technical Analysis Made Easy course. 10:04 the opening range was 3.5, suggesting a day's range of 9 or 10 points. Two moon days are those that have Moon Timelines near 10:00 and 4:00 . All times are Eastern. 9:27 on the SPSunMoonMer chart the early high was set by Mercury M+135. And Moon T+180 is support. The last low yesterday was on the Sun +H135 electric field flux. 9:14 Today's trade times are 10:59, 13:21, and 14:43 . The trend set yesterday is up. 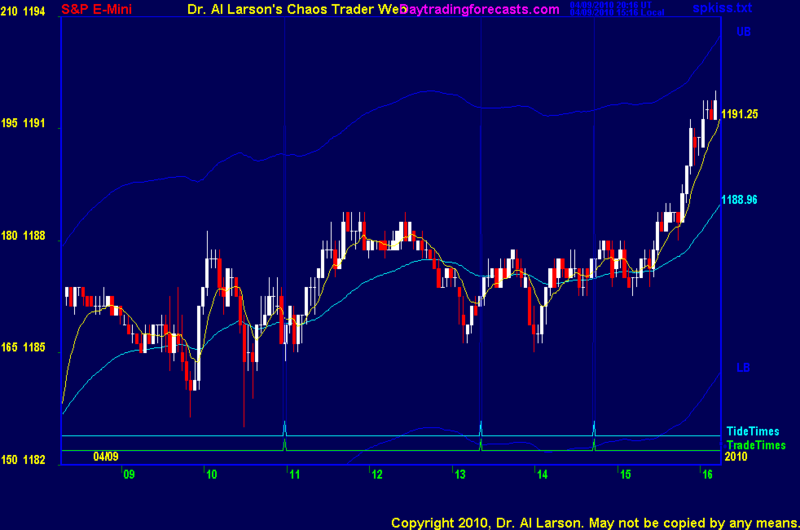 4/9/2010 2:01:56 PM MT MJ:: Brilliant trading Dr. Larson. Learned a lot today, particularly about trading psychology. 4/9/2010 10:57:46 AM MT EOE:: not much juice right now. everything looks flat. 4/9/2010 10:50:58 AM MT mm****:: Nine ! 4/9/2010 8:15:15 AM MT EOE:: nice overlay AL.